This entry was posted on August 30, 2018 at 11:17 pm and is filed under Art and War. You can subscribe via RSS 2.0 feed to this post's comments. You know at least one person who’s watched it. It’s available on iTunes, FYI. Kevin wasn’t impressed by the enlisted guys calling each other sir, but authors generally have no control over such things. Agree that it’s well acted with vivid combat sequences. Definitely worth watching, not least to support filmmakers who want to tell war stories other than American Sniper-type fare. This is fantastic, Peter, as ever, and a will-watch for me. Thanks. Appreciate your note that Powers brings mothers and homecomings into the narrative. I met Powers once and we briefly, exhaustedly chatted, and talked about kids. This post may have only generated two comments, but when one is from Brian Van Reet and the other’s from Andria Williams, I’m feeling pretty honored. 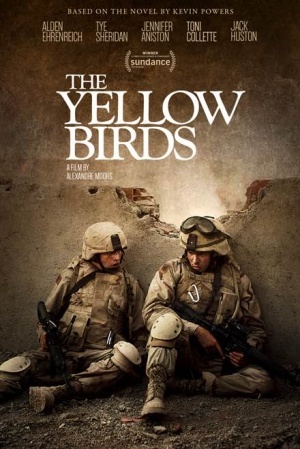 Thanks for the kind words, Andria, and you should definitely think about reviewing The Yellow Birds for the Military Spouse Book[/Film] Review.